Kidd still holds the Canadian junior record for 5,000 metres, with a time of 13:43:08, set in June 1962 in Compton, California. Bruce Kidd was Canada’s top middle-distance runner in the early 1960s and has remained an advocate and historian for sport. 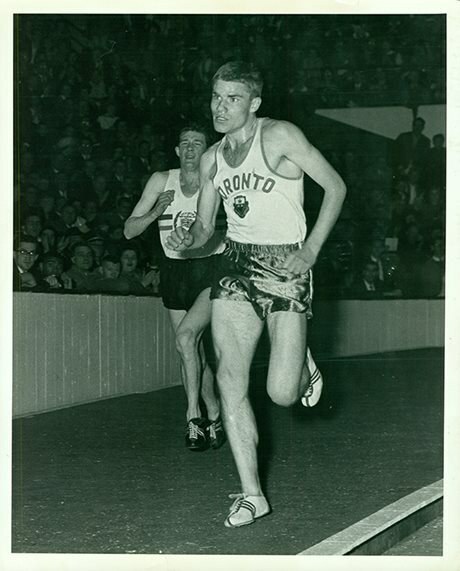 Kidd began training at the age of 15 under Fred Foot of the East York Track Club. In January 1961, Kidd rose to fame at the Knights of Columbus meet in Boston, where he broke the meet’s record time for the two-mile event and was the first Canadian to win on the American indoor track circuit. Kidd’s running career reached a pinnacle at the 1962 British Empire and Commonwealth Games in Perth, Australia when he won gold in the six-mile event and bronze in the three-mile event. In 1963, Kidd was credited with inspiring the Telegram Maple Leaf Games, an indoor track meet held at Maple Leaf Gardens. He retired from running after the 1964 summer Olympics and turned his attention to academics. He has a Masters degree in education from the University of Chicago and a Masters and PhD in history from York University. He joined the University of Toronto’s Physical Education department in 1970 and was appointed the interim vice-president and principal at the Scarborough Campus in 2014. In addition to academics, Kidd is a passionate advocate for eliminating racism and sexism from sport. Read an article by Kidd on the history of sport in Ontario in the Trust’s magazine Heritage Matters. Watch a documentary on Kidd from the National Film Board of Canada. Learn more about Kidd on the Canada’s Sports Hall of Fame website.